Hello, My crabs have a lot of extra shell. They always get dirty with sands inside. Should I clean the shell? 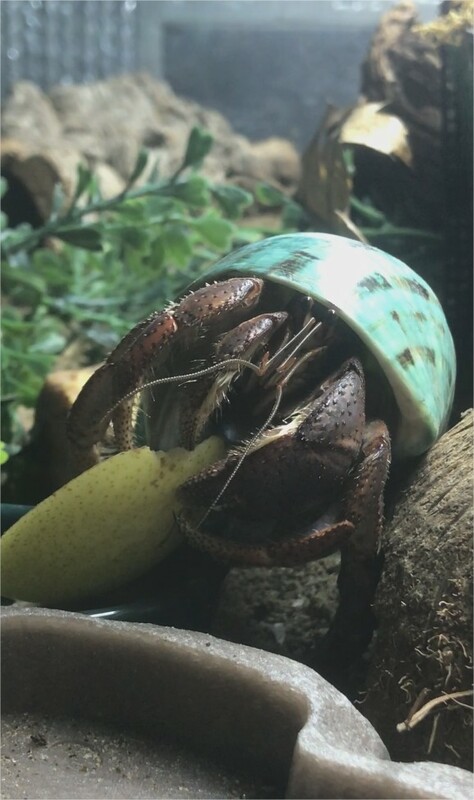 is my crabs going to take a shell that is dirty with sand? I cant rinse the shell weekly, I could but I mean it’s a lot of work. Topic: Leaf litter need cleaning? Re: Leaf litter need cleaning? She have a couple acre of forest with maple. No body go there so i know its not spray. Do you guys know what other leaf then maple PP love? I have actually access to all the maple leaf in Canada right now. Can I just grab a bunch of leaf from the ground and toss it in the crabitat? Like that? Do I need to clean them first? I got 9 inch of substrate. They both are down right now so I think I will wait ..
Topic: Transition From 1 1/2" to 2"
Re: Transition From 1 1/2" to 2"
HERMIT CRAB OPENING: APPROX. 1 3/4TH INCHES. If I have a pp with 1.5" inch opening is it ok if I get a couple of 2" inch opening shell? or should I really search the dark side of the web to find a 1" 7/8 or 1" 3/4? Topic: 3 PP and some questions! 3 PP and some questions! I'll bring back home some banana, peach and apple for sure!! !